One of the most vibrant cities in the world, Miami has always looked to its past, preserving and celebrating its unique microcosm of Art Deco architecture while embracing the demands of a new generation of travellers. From Art Basel Miami to the International Book Fair, the Magic City welcomes contemporary adventurers but always ensures the events, parties and festivals it hosts fit within the environment and complement the city’s heritage. 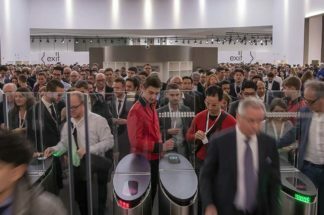 Therefore, Miami was the perfect place for Montblanc to preview its 2019 watch collection, which it did to great acclaim late last year. Although there has always been a huge respect for the past achievements of the Minerva facility in Villeret, which is now home to Montblanc’s manufacture, they have not always been readily promoted by the brand. 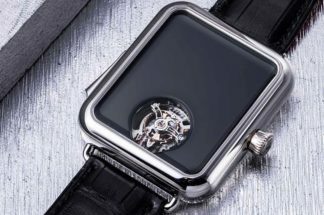 Three men have been responsible for changing that, namely Montbanc’s ex and current CEOs Jérôme Lambert (now CEO of Richemont Group) and Nicolas Baretzki, and the brand’s Managing Director of Watchmaking, Davide Cerrato, who has long admired the simple beauty and technical achievements of Minerva. And the lessons learned from the purity of design and incredible movements of the defunct manufacture have never been more evident than in this year’s Heritage Collection, which celebrates the Villeret masterpieces of the 1940s and 1950s. 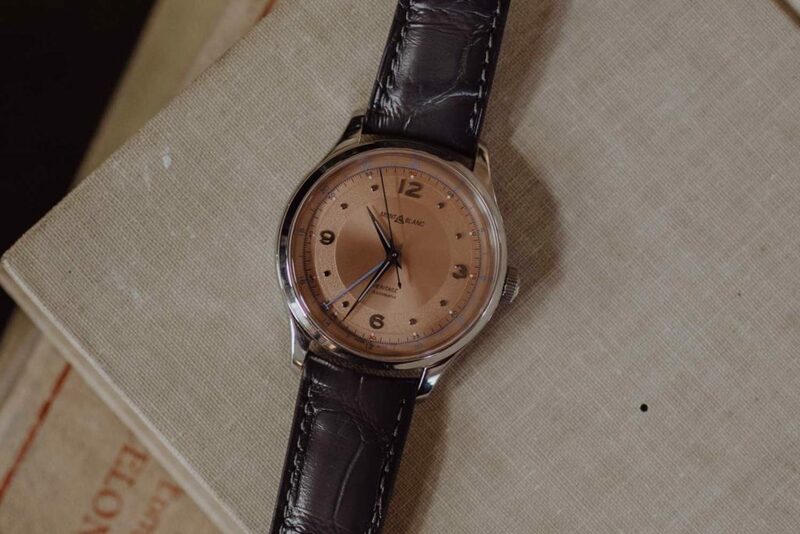 Domed dials in period colours such as salmon, silvery-white and a delicious toffee shade that the brand refers to as “smoked caramel”, sit inside cases of elegant but contemporary proportions. 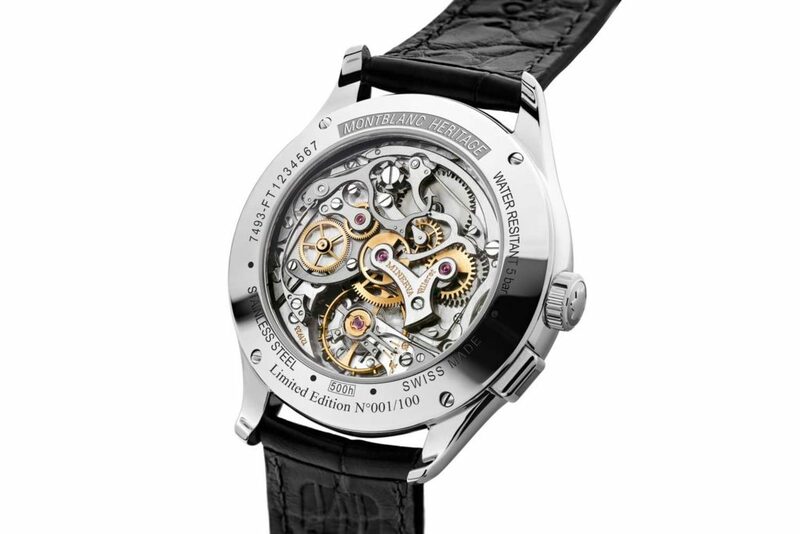 Polished cases between 39mm and 42mm feature curved horns and box sapphire crystals, while the chronograph markers at 3, 6 and 9 are elongated in a quirky reminder of the connection warning pips sounded by payphones from the 1940s, ’50s and ’60s (think North by Northwest, Charade and His Girl Friday). The collection houses new manufacture movements inspired by the best of Minerva. All the pieces are water-resistant to 50m and have undergone the hours of trialling required by Montblanc’s Laboratory Test 500. All straps are Sfumato alligator-skin strap made in Montblanc’s Pelletteria in Florence. The big headline grabber for 2019 is sure to be the Heritage Pulsograph. A monopusher chronograph with column wheel and horizontal coupling, and limited to just 100 pieces, the 40mm steel-cased watch hosts a domed salmon dial with dual finishings featuring a pulsograph indicator graduated for 30 pulsations – a throwback to the days when doctors used their wristwatches to check a patient’s heart rate – plus anthracite numerals and dot indexes, curved Dauphine hour and minute hands and blued chronograph hands. 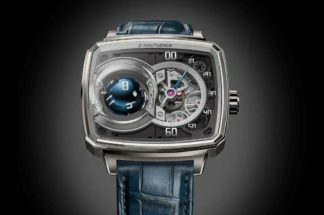 Powering the piece, and visible through the sapphire caseback, is Montblanc’s monopusher chronograph Calibre MB M13.21. Again, limited to just 100 examples, the Montblanc Heritage Perpetual Calendar is the most complicated piece in the new collection and is powered by a brand-new in-house movement: Calibre MB 29.22. As well as featuring the expected hours, minutes, day, date, month, moon phase and leap year indications (with an additional dual-time function and a 24-hour indicator) in 3, 6 and 9 sub-dials, the movement, which is made up only of wheeled gears eschewing any levers, allows adjustment, via the crown, in both directions, making setting a much easier and quicker task. An additional safety feature prevents accidental damage to the movement by locking the correctors and preventing adjustments between the hours of 8 and 12pm. Housed in a 40mm red gold case with box crystal and white dial, a version in steel is also available, limited by production rather than numbers. 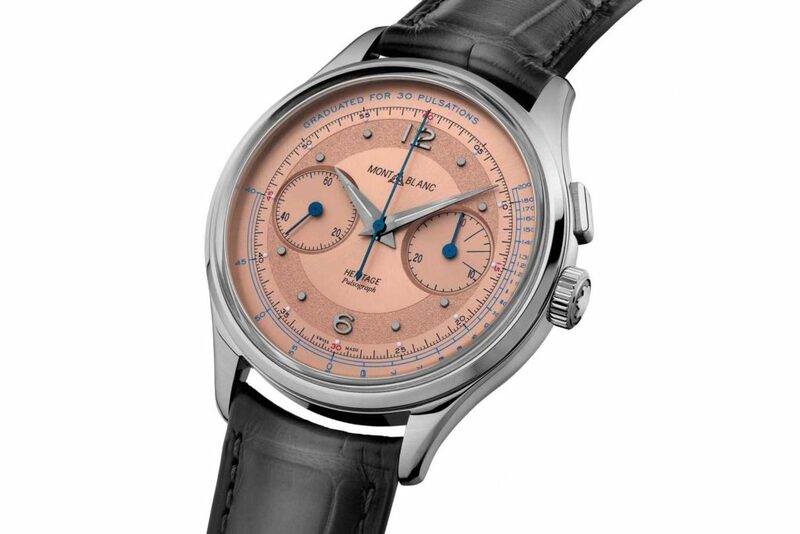 Something that is sure to delight die-hard Montblanc fans, and catch the attention of those new to the maison, is the introduction of an accessibly-priced monopusher chronograph. A specialism of Minerva, and a coveted yet comparatively rare complication, the watch will sit at the heart of the Heritage collection. As with the more expensive Pulsograph, the dial finishing involves two processes, giving the domed, silvery-white face a luxurious feel. 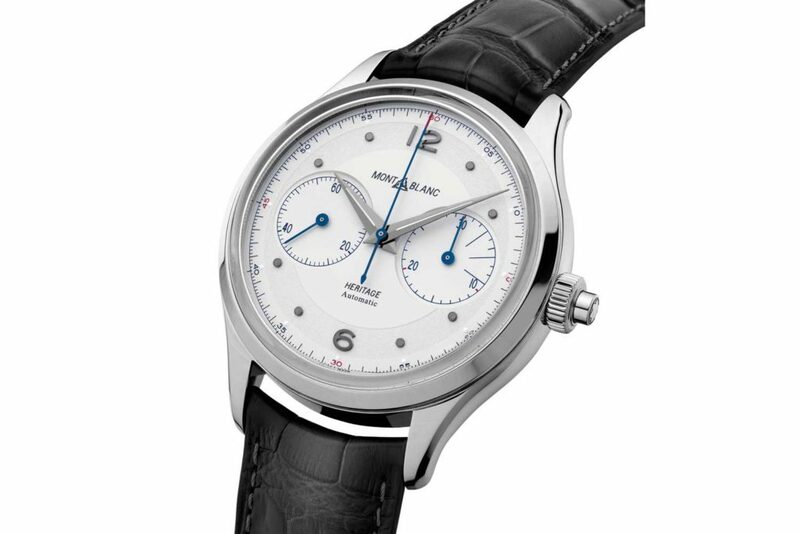 Sub-dials at 3, 6 and 9, applied numerals and dot indexes, an elegant minute track, curved hour and minute hands plus a blued seconds hand and chronograph indicators give detail to the 42mm stainless steel cased watch that features an embossed design representing the Minerva manufacture on its caseback. Inside beats the automatic Calibre MB 25.12 monopusher chronograph movement. 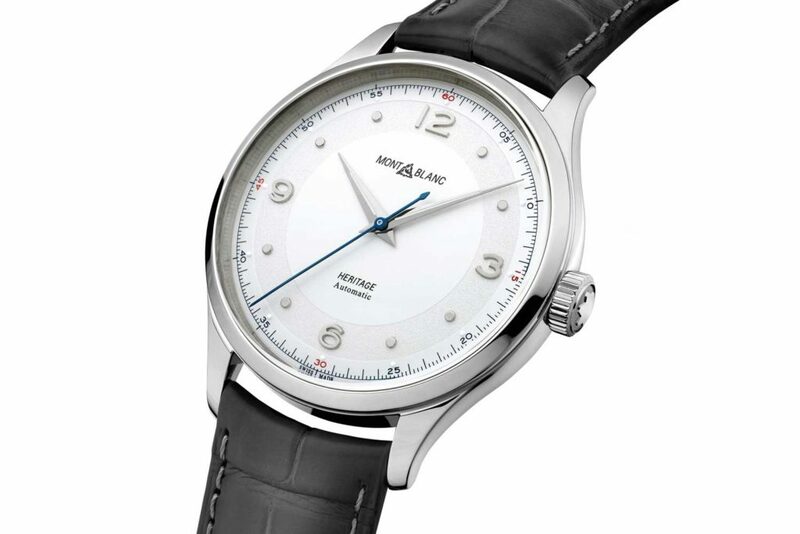 Housed in a 40mm, fully-polished, stainless steel case, the back of which is embossed with an image of the Minerva manufacture, there are three versions of the stylish new GMT – a silver-white domed dial with grey strap or steel Milanese bracelet, or the uber-elegant salmon dial with grey strap. 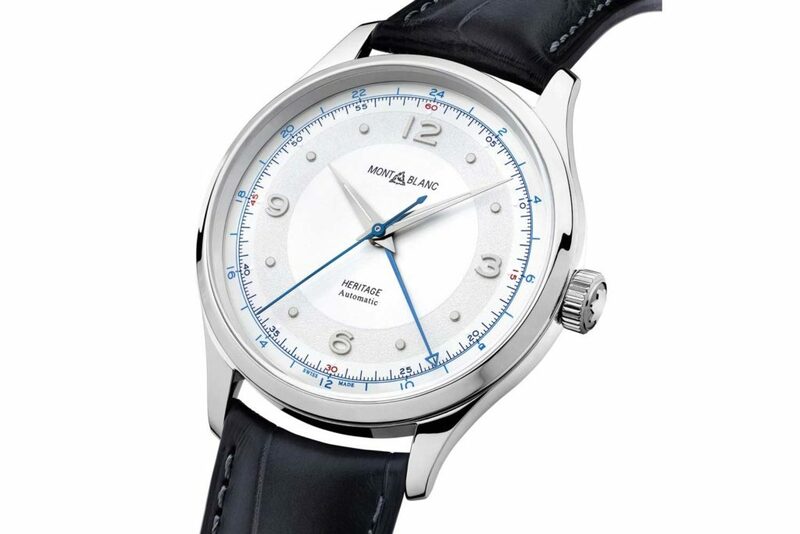 All feature applied Arabic numerals and dot indexes, curved Dauphine hour and minute hands, blued baton seconds hand and blue, curved baton GMT hand with a heritage Montblanc logo at 12 o’clock. The timepieces are equipped with the automatic MB 24.05 calibre with 24-hour GMT function. 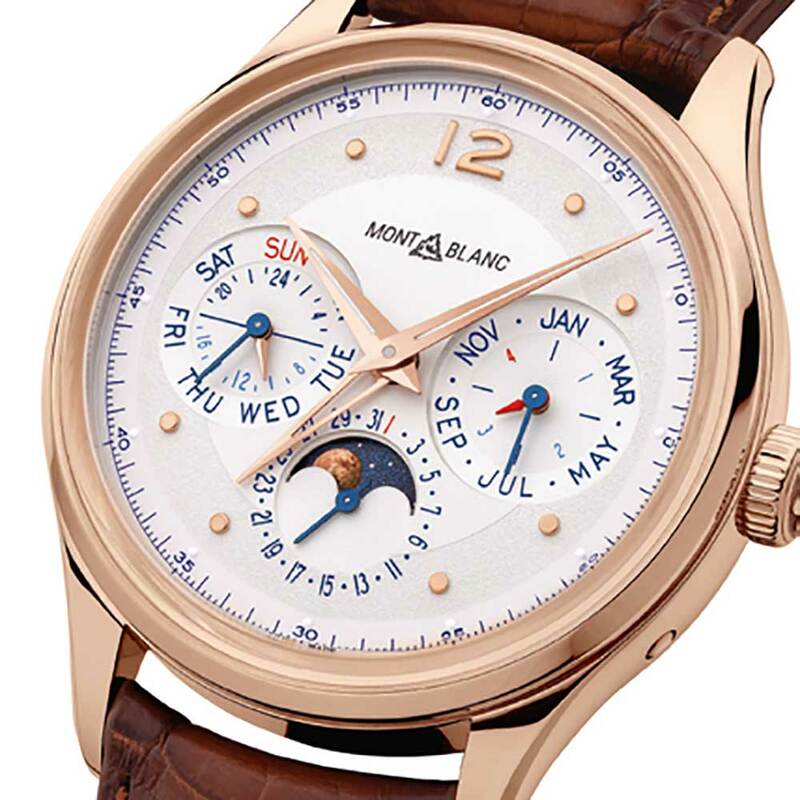 One of the most useful functions around, Montblanc has made the day-date a staple of its collections and the Heritage family is no exception. Housed in a 39mm, fully-polished stainless steel case with the Minerva manufacture embossed on the caseback, the domed white dial has applied Arabic numerals, dot indexes, rhodium-plated hands and a heritage logo. Inside beats the MB 24.18 automatic calibre with 38-hour power reserve. 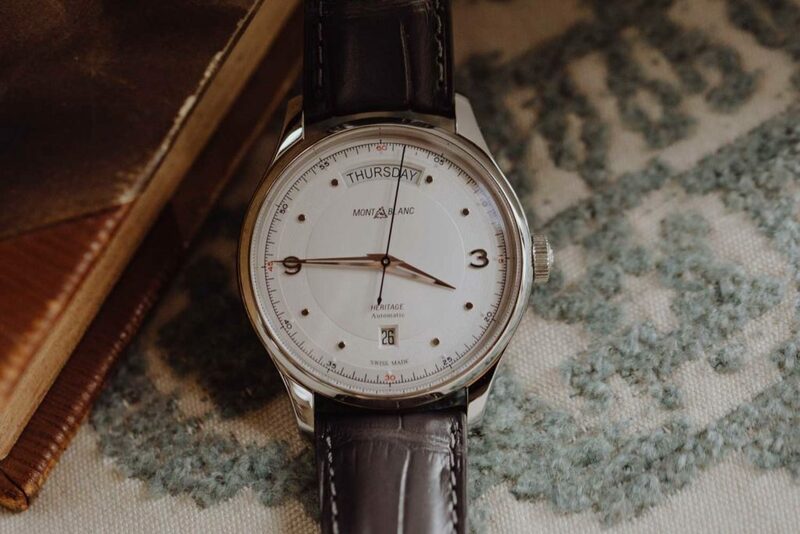 The core of the new collection and the starting point for many of the lesser complicated pieces, the Heritage Automatic is available in a 40mm stainless steel case with either white or salmon dial. Both feature applied Arabic numerals, dot indexes and rhodium-coated or anthracite-coloured hands coated with Super-LumiNova. 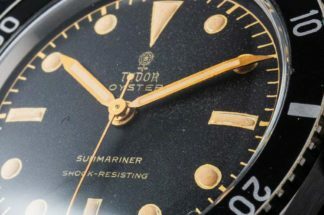 There is also a red-gold version with caramel-coloured dial and gold-plated dot indexes. While the steel models come on either a grey strap or a steel Milanese bracelet, the gold version is supplied with a brown strap. The watches are powered by the MB 24.27 automatic movement with 42-hour power reserve.